Breakout Furniture - FREE INSTALLATION! Our tub seating solutions offer you a relaxing and comfortable place to sit. 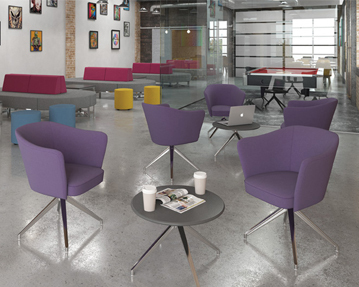 These chairs are perfect for a range of different environments, including breakout rooms and receptions areas. Each tub style chair in our collection has angled sides and a stylish profile, giving your space a cool, contemporary look and feel. These models have padded seat and back sections, as well as supportive armrests. You can take your pick from a selection of high quality fabric finishes, and you can choose your preferred colour too. Our tub seating is available in hues such as red, purple, blue, black, green and pink.